In keeping with my passion for classic cinema, here is an article I wrote in advance of a special screening of the great John Ford-John Wayne Western, The Searchers. Early in my cinephile life I have to admit I was not familiar with this film except for reading references to it in various history books and seeing an occasional clip from it in documentaries. These teases definitely whet my appetite to see the movie, but growing up Omaha , Neb. offered limited opportunities at best to see classic films in theaters and I do believe The Searchers was unavailable for television screenings for a long while due to rights issues, or even if it was available it would have not have been shown in letterbox format, and thus the film’s impact would have been severely diluted. I seem to recall that a friend of mine, Gary Anderson, whom I worked for on a few occasions, first turned me onto the fact this was a film essential I absolutely had to see. If memory serves, Gary named his first born son Ethan after the character Wayne plays in the picture. I finally did see The Searchers in my 20s or 30s, and I was immediately struck by the sweep of its epic storytelling and the power of its uncompromising themes. I have seen it several times since, always finding it a richly rewarding experience, and like the best Ford films, always discovering ever deeper currents in the images and the performances, in the music and the settings. This article for The Reader (www.thereader.com) appeared in advance of a revival showing at the Indian Hills Theatre, which was one of the few remaining Cinerama theaters in the nation. Watching The Searchers on the big screen, from the balcony, has to rank as one of my all-time filmgoing experiences. As it turned out, it was one of the last films shown at the theater, which was torn down to make way for a parking lot. NOTE: This blog also contains my take on Ford’s and Wayne’s other late masterpiece, The Man Who Shot Liberty Valance, in a story I called, “Through a Lens Darkly.” I also have many other film entries on the blog, including pieces on such other classic films as Casablanca and It’s a Wonderful Life and on filmmakers as diverse as John Landis, Joan Micklin Silver, John Jost, and Alexander Payne. Legendary Hollywood director John Ford, that great visual poet of American cinema, cut his teeth on two-reeler horse operas in the silent era. Bigger-than-life actor John Wayne, that symbol of virle patriotism, learned his craft toiling in cheap cowboy flicks. Ford helped give Wayne his on-screen start when he hired the charming young prop man as a bit player in his 1929 picture Salute. By the early 1930s their careers were heading in opposite directions. Ford, already a top-flight director at Twentieth-Century Fox, achieved great acclaim outside Westerns while Wayne, who got a break starring in Raoul Walsh’s epic The Big Trail, discovered Hollywood fickleness when, after that pic failed, he was banished to quota-quickie shoot-em-ups. The Duke despaired his second chance might never come. Then, in 1939, Ford instinctively cast Wayne as the Ringo Kid in Stagecoach, a landmark film artfully shot in Monument Valley and dynamically edited for peak dramatic effect. The smash hit proved the Western could be both a box office and aesthetic success and made Wayne a bankable screen presence. In the post-war years Ford made a cycle of classic Westerns that ensured his status as the great populist interpreter of the American West while Wayne reigned as both a perennial superstar and American icon. When Ford consistently chose Wayne to embody the hero in his films, the men were forever linked in cinema history. Long into their fabled collaboration, the pair teamed-up for The Searchers, a 1956 Warner Bros. wide-screen Technicolor Western far darker in tone than Stagecoach yet every bit as riveting. A favorite of film buffs, The Searchers displays Ford at the height of his creative powers and stars Wayne in one of his deepest performances. On September 23, area film fans will join celebrities and surprise guests for a special one-night only salute to John Wayne and The Searchers at Carmike Cinemas’ Indian Hills 4 Theater in Omaha. The program, a benefit for the National Kidney Foundation of Nebraska, begins at 7:30 p.m. with a pre-show, followed by The Searchers projected on the theater’s 70-foot wide Cinerama screen, one of a handful still in existence. The presentation is the latest event from Omaha film maven Bruce Crawford, who has organized classic movie programs since 1991. In typical Crawford fashion he is pulling-out all the stops for The Searchers. He has secured a restored vault print from the Warner studio archives. And in his usual showman-like way he has planned a gala evening complete with searchlights, paparazzi, red carpets, limos, Western reenactors and balladeers and a theater lobby display of Wayne memorabilia on loan from The Birthplace of John Wayne museum in Winterset, Iowa, where The Duke was born and raised. Why all this fuss about an old Western? 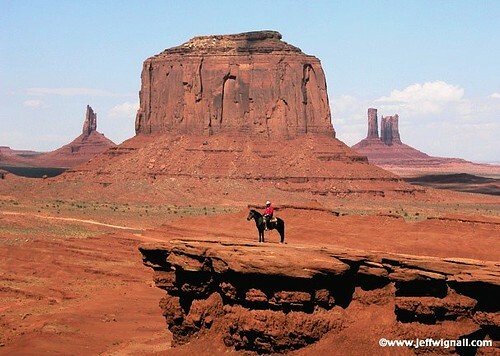 To double for the Texas setting of The Searchers Ford selected evocative Monument Valley in Arizona, where he returned again and again for his Westerns, and this time captured its sweeping beauty in VistaVision, a wide-screen photographic process. 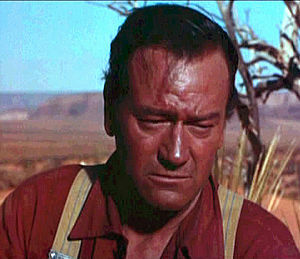 It is said John Wayne regarded his role in The Searchers as his favorite, which is surprising given how morally ambiguous the character is compared to the late actor’s typical screen persona as a rough-hewn but fair-minded man of action. The Searchers came along at a time when the Western genre was starting to reflect the anxious new realities of the Cold War era and, with it, directors like Ford were taking a more mature, even revisionist view of the Old West, which had been depicted in overly simplistic and blatantly biased terms. In keeping with these changes, Wayne interprets Ethan Edwards as an obsessed man with an almost psychotic racial hatred. The character is more troubled than any previous Wayne screen incarnation (with the possible exception of the driven cowhand-turned-ruthless cattle baron he played in Howard Hawks’ 1948 Red River). As Ethan Edwards, Wayne is a man adrift — a Confederate veteran estranged from society. It is a demanding role and Wayne delivers the goods under Ford’s direction. Ford liked using a core company of actors and Wayne became the marquee member of the stock players Ford repeatedly drew on for his films. By the time the cameras started rolling on The Searchers, Ford and Wayne were as closely identified with each other as any director-actor combo before or since. In Crawford’s view, Ford knew Wayne could project the very qualities his protagonists embodied and utilized Wayne’s “strong silent charisma” like no one else. Ethan Edwards is returning to the frontier Texas wilderness and the only family he knows after a separation of many years. There is a tragic quality about Ethan, who during his long sojourn has lost his former sweetheart, Martha, to his brother. Harboring a deep hatred for Indians, he cannot accept the part-Cherokee teen, Martin Pawley (whom Aaron and Martha adopted after Ethan rescued him during an Indian raid in which the boy’s parents were killed), as his nephew. After living a nomadic bordering-on-outlaw life since the war, Ethan clearly longs for the domestication his kin enjoy, but events prevent his reintegration into civilization. When an Indian raiding party, led by the Comanchee renegade Scar, attacks neighboring homesteads, Ethan and Marty (Jeffrey Hunter) join Texas Rangers in pursuit of the marauders. In Ethan’s absence, the raiders attack Aaron’s place, killing Aaron and Martha and kidnapping Lucy and Debbie (Natalie Wood). The killings and abductions set Ethan, Marty and others off on an epic avenging search across the desert. It is a quest fueled more by Ethan’s blind rage than justice. After Lucy is found dead and violated, Ethan leaves no doubt he means to kill both Scar and Debbie, whose virtue he deems irretrievable. While Ethan is unrelenting in his pursuit, Marty, who abhors Ethan’s plan, is just as unbending in his will to prevent any harm coming to Debbie. When, months later, the decimated search party is no closer to finding her, only Ethan and Marty remain to carry-on. 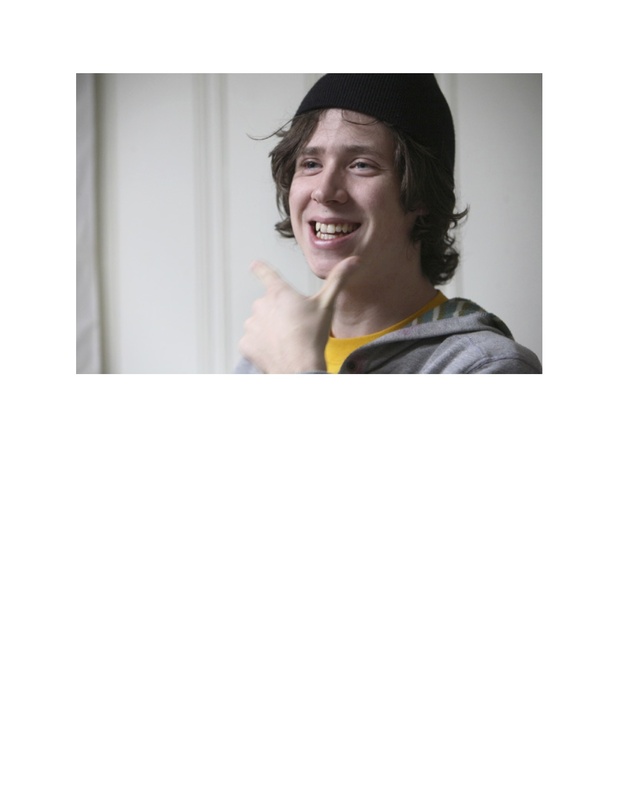 Beyond all reason, their search stretches over a decade, with Ethan growing more callous each year. In the end, Scar is finally dealt with and, after chasing his niece into the mouth of a cave, Ethan spares her, uttering the famous line, “Let’s go home, Debbie.” By sparing her, he reclaims part of himself. The final scene, Debbie’s homecoming, is perhaps the most poignant ending in movie history. As Debbie and Marty are embraced by the family he is marrying into everyone sweeps inside the house to celebrate except for Ethan, who stands awkwardly in the doorway — poised between redemption inside and oblivion outside. It is the same framing device used for Ethan’s arrival at the film’s start. As the door closes behind him, he is cast adrift amid the wilderness. An eternal wanderer searching for a home to call his own. The ending is rife with resonance. First, it is a suiting elegy for the dying-breed of Westerner Ethan epitomized: he must move on because his job is done and his time has passed. The end is also a requiem for the Western itself, which was fast dying out due to changing cultural tastes and the glut of TV Western series. Finally, the ending is a tribute to Harry Carey, Sr., one of the first great Hollywood Western stars. When Wayne stands astride the doorway, he reenacts a trademark pose of Carey’s — clutching his right hand to his left elbow — before trekking off alone. There was a strong connection between Carey and The Searchers’ director and leading man. John Ford helmed many of Carey’s silent Westerns and John Wayne admired Carey as a kind of role model. Additionally, Carey’s son, Harry Carey, Jr., has a supporting role in the film and was a regular stock player in Ford pics.